One of our favorite rivers for it's remote feel, amazing scenery, strong big bug hatches and rural heritage, the Big Blackfoot River is a classic that should be on the bucket list of every serious angler. The river that Norman McLean made famous tumbles off the Continental Divide and runs westward down the Blackfoot Valley through towns like Lincoln, Ovando and Potomac before emptying into the Clark Fork near Missoula, Montana. The Blackfoot is also easily reachable from Helena and Great Falls, Montana. 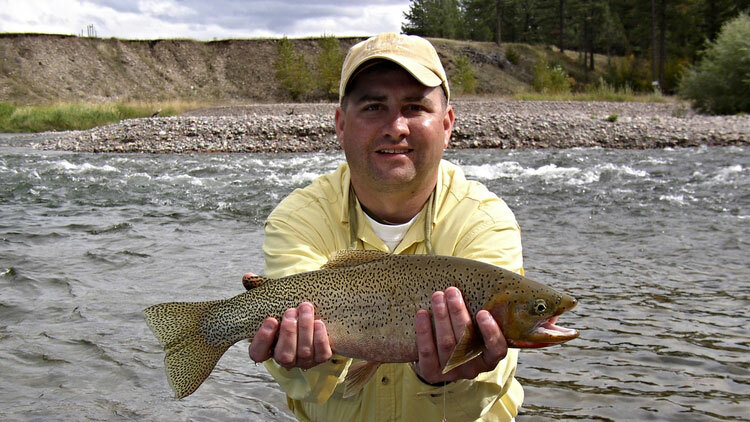 The freestone Blackfoot River and it's tributaries are home to a great population of native westslope cutthroat trout and bull trout as well as brown and rainbow trout. As a general rule of thumb the Blackfoot River is a big, bushy dryfly fishery and the trout there will swim to the surface to gulp down a good looking stonefly, grasshopper or yellow-bellied mattress thrasher. The Blackfoot River is not considered much of an early season fishery due to it's higher elevation, big snowpack and chilly waters. But once run-off has subsided the Blackfoot show it's true colors - salmonflies, golden stoneflies, caddis, green drakes which then lead to the flying ants, hoppers and spruce moths that feed it's trout through the summer months. Fall is amazing in the Blackfoot Valley, probably our favorite season there, the larch pines changing color before your eyes and the trout stuffing their faces before winter returns. It ends early on this river though, usually by mid-October the water temps have dropped, the snow is flying, and the trout have gone to rest. The upper half of the Blackfoot is relatively small with many log jams and is best suited to wade fishing. Once the North Fork and mainstem join together it becomes floatable and we primarily use rafts due to the rock gardens and periodic class 2 and 3 whitewater sections in the 60 miles to the confluence with the Clark Fork.